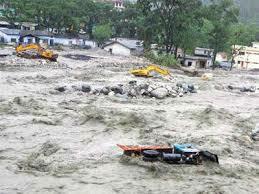 The recent nature’s fury in Uttarakhand and the destruction in its aftermath are of mythical proportions. It is aptly called ‘nature’s fury’, as it does seem to be anger of nature or the gods. 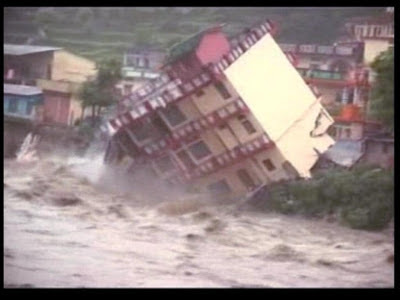 Mythology has mention of nature’s fury in terms of floods which had decimated mankind, save a few chosen ones. 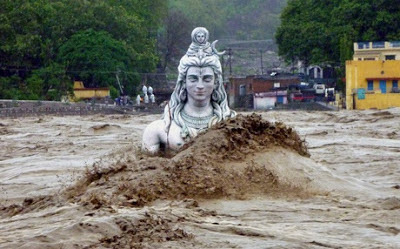 All the mythologies, be it Hindu, Christian, Greek, Babylonian, Mayan, or even tribal myths, are replete with myths which mention the end of the world brought due to massive flow of waters from the skies. It is said there are close to 500 variants of the same myth, which has a common thread running through them, collectively referred to as Flood Myths or Myths of Destruction. God created the universe and its inhabitants, humans, animals, plants, etc. But humans had started to disregard God and His importance, and had also become wicked and greedy. Man had also stopped following the laws framed by God for them. This angered God and He decided to destroy all that He so painstakingly had created. However, God chose one person, who was good and noble. Different mythologies have different names for him, be it Noah, or Manu, or Utnapishtim or Deucalion. God asked him to create an ark which should be big enough to house all of what God wanted him to take along with him. Once done, there was a huge downpour, which took along with it, everything that was there on earth. The ark created by God’s chosen one, is saved by God, which floats for sometime till it drops anchor on a mountain. After the waters recede, the chosen one, comes out of the ark, offers sacrifice to the gods and starts afresh, as directed by the gods. The above is more or less the common thread in all the myths related to the fatal flood inflicted on humanity by God. The reason? Gods unhappiness with mankind. The chosen one’s promise was that man would never waver from the ways of God and would never do anything to anger Him again, having witnessed the wrath of God. Accepting man’s promise, God too is supposed to have promised that He would never unleash such destruction again. As a seal of His promise, God created the rainbow, which according to the Biblical traditions, is also referred to as the Arc of Covenant, or the arc depicting Gods promise. Seeing the scale of destruction in Uttarakhand, it seems like God has decided to break his promise. Why else would he unleash such fury, which has decimated towns and villages and wreak havoc of mythical proportions? Not only were humans killed, but even plants and animals, which probably didn’t even get a chance to complain. Ironically, even people who had gone for pilgrimage were not spared. Was anger on pilgrims fair? Should God have wreaked such havoc on people who had come to Him and seek His blessings? Should God have done this to children who were probably just born or those who had not even been initiated to the ways of the world forget about crimes. Just why was God so cruel and what was He avenging? I don’t have the answers and nor am I the chosen one, unless I see myself as the one who decided not to go on a pilgrimage to the land of the Gods. Unless I see myself as someone who has been spared due to the inability to visit such places for reasons of modernity. Unless I see myself as someone who has been spared to write this piece and hope like hell, that people see some sense in such madness. I claim ignorance. But if I am to apply my limited sense, I can see numerous reasons for God to be angry with mankind. God must be upset, for destroying the forest cover that he so carefully had created. He must be upset for eliminating all the animals and the foliage that he had created ages back to reside in the same. God must be angry for illegal mining of his land, or illegal construction over his land. He must be angry at the exploitation of his beautiful land for all the wrong reasons by all the wrong people, who are in charge of administrating His laws. Modernity has made changes in such laws, and with changing times, changes have to be brought in, but they still can’t be overruling the laws of nature and if man thought that he can get over by such overruling, then this act should bring man back to the ground. However chilling and disturbing this act of nature’s fury be, if we don’t wake up and mend out developmental ways, we can expect some more. God forbid, if authorities cannot. Only for people in Mumbai, India. Last time we read about the crimes and punishment of Tantalus. Tantalus had three children, Pelops, Broteas and Niobe. Pelops was resurrected by the gods, but the other children had to face the wrath of the gods. Before we move on to Niobe, an important mythical figure, let us briefly refer to Broteas. Broteas had once insulted the goddess Artemis (a folly repeated by her sister as we will see later) by refusing to honour her and so he was punished by turning him insane. In his insanity, he thought he was indestructible to the flames of fire and to prove it, he jumped into the fire. However, he was consumed by fire and that’s the end of it. His arrogance to the gods was his nemesis, a fate that was similar to that of his father. Niobe was the daughter of Tantalus. She got married to Amphion, the ruler of Thebes. Amphion incidentally played the lyre so well that his music could sway the trees and move stones. It is said that the walls of Thebes were rebuild by this magical music of his. Niobe had seven handsome sons and seven beautiful daughters (the number of children differs from text to text), collectively referred to as Niobids. It is said that Niobe too had the genetic fault of hubris that she had inherited from her father. In Thebes, during annual festival of honouring Leto and her offspring’s, Apollo and Artemis (aka Diana), Niobe is supposed to have ridiculed Leto. Dressed in her royal finery, she chastised people for worshipping Leto and her children. She felt that it made no sense in worshipping those who could not be seen. She belonged to the house of Tantalus, the one who dined with the gods. She was the queen of the Thebes, and the wife of Amphion who had built the city. Most importantly, she was the mother of seven sons and seven daughters, whereas Leto had only one son and a daughter. A 1772 painting by Jacques Louis David depicting Niobe attempting to shield her children from Artemis and Apollo. This brazen display of arrogance hurt Leto so much that she complained to her children, Apollo and Artemis. 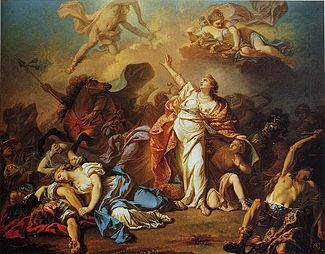 Apollo shot at Niobe’s sons and Artemis killed all her daughters, leaving her without any children, her objects of pride. Amphion killed himself when he saw the sight of his fourteen dead children. It is said that the dead bodies lay in a pool of blood for nine days and later the gods buried them. It is said that a violent whirlwind later took Niobe from Thebes and dropped her at Mount Siphylus where she is supposed to be shedding tears till date. 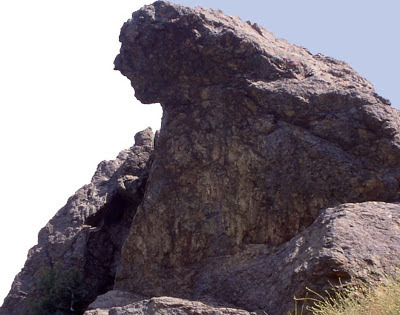 The Weeping Rock in Mount Siphylus is supposed to be Niobe which resembles a mourning woman. The rock is always wet, which is why it is called the weeping rock. Geographers and mythologist have found many features on the rock which resemble a face of a sad woman. From a distance, one can see resemblance to long hair, eyes, and nose, etc. This spot today is a major tourist attraction, a stone which is always wet. This is an interesting myth, where a very loud message is being given. First, that the follies of parents can have repercussions right down to their children and so it is advisable to follow the path of righteousness, not just for one’s own self, but also for their children. Second, pride and arrogance is always the cause of downfall. Niobe was extremely proud of her background, her husband and her children, needless to say, that none of which came to her aid. Her pride was reduced to a pile of dead bodies and her, a stone. Finally, it is good to learn from the lessons that have been laid down before you. Niobe had seen her father’s predicament and ought to have known the outcome of going against the gods, but she too had the streak of hubris in her which led her to a worse state than her father and brother, Broteas. Modern day scholars might see this as an act of vengeance by the gods, but the Functionalist school of mythology sees this as setting a norm of behaviour in the ancient times. Such tales set an expectation from people towards their gods. The fact that gods were for reverence and not ridicule gets reiterated in the tragedy of Niobe, who doesn’t learn from her father’s tragic end. Except for Pelops, who gets resurrected by the gods, the entire family of Tantalus had tragic end and the successive generations didn't do any better, which were all tragedies of epic proportions. To conclude, the element Niobium was named after Niobe and in the Periodic Table finds a place right under the element Tantalum, named after Tantalus, Niobe’s father! In the early days, a number of elements were named after Tantalus’s children, like Pelopium, Dianium, Ilmenium, however by the time the Periodic Table was finalised in 1950, only Niobium survived, while the others might have been re-christened. Is this a case of another tragedy inflicted on Tantalus’s children by the scientists of today?!? The myth of Tantalus is an interesting Greek myth. Tantalus was a mortal son of Zeus but unlike other mortals, was a favourite with both the gods and Zeus. He was probably the only mortal, who was allowed to dine with the gods, especially the dinner-for-gods-only kind! However, such love was not quite reciprocated by Tantalus. He had the habit of listening to the divine secrets of the gods and pass it down to the humans, more as a boast to prove his divine proximity. A few times he even tried to steal the ambrosia, divine drink of the gods, to share it with the mortals. Once, one of the gods stole Zeus’s golden pet dog and gave it to Tantalus to hide it. Later when the god came to ask for it, Tantalus claimed ignorance and said he never was given such a dog. It took Zeus’s intervention, who sent his messenger to find the dog. Such acts of misconduct were occasionally pardoned, as he was the favourite and thus Tantalus never took the gods seriously. Once to prove the gullibility and the foolishness of the gods, he invited them for dinner to his castle. He then cut his son Pelops to pieces and made a stew out of it and served to the gods. None of the gods had quite had the stew except for Demeter, who unmindfully chewed into what turned out to be the shoulder of Pelops. She was not in a proper frame of mind as she was mourning for her daughter Persephone (Read more about it in This is Utkarsh Speaking: Demeter & Persephone). When she realised what had happened she alerted all the gods, who were now furious. 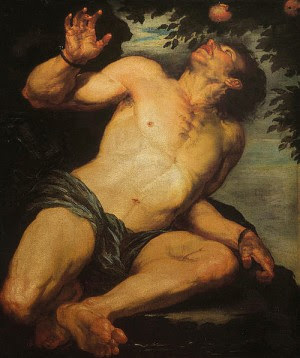 Zeus decided to punish him severely for this act of trying to make cannibals out of the gods. As a punishment he was sent to the Tartarus, the lowest region of the Underworld. There he was chained in a lake and made to stand under a tree full of ripe and juicy fruits. However, whenever he tried to pluck a fruit, the fruit would move away from him and whenever he tried to drink water from the lake, it would recede, thus depriving him of all nourishment. This gives us the word, tantalise, meaning ‘to tease someone with the sight or promise of something that they cannot have’ (Oxford Dictionary). To tease him further, sometimes the waters of the lake would rise up to his chin, but the moment he tried to drink, the waters would recede and all he would find was mud all over him. If he tried to take the waters in his hands to drink, it would flow off his hands by the time it reached his mouth. This left Tantalus eternally frustrated. Some authors have also said that Zeus punished him further by hanging a stone over him which was always threatening to fall on him and he was eternally trying to dodge the same. The gods were so disappointed with him, that the entire family and the descendants of Tantalus were cursed to end in tragedy. (next time we will read about his daughter Niobe). However, the gods managed to resurrect his son Pelops, with an ivory shoulder, since Demeter had taken a bite of the shoulder. Pelops goes on to live a long life (To read more about Pelops, read This is Utkarsh Speaking: Olympic Games – Mythical Origins), and was probably the only one who escaped the wrath of the gods. Many scholars were of the opinion that Tantalus was a historical figure possibly the ruler of a city called Tantalis or of a city by the name of Siphylus. Near the present day Mount Siphylus, many archaeological remains have associations with the House of Tantalus and his children. What is of importance is the crime and punishment. Tantalus’s crime seems to be less of killing his son, than of making the gods cannibals! In the ancient times, killing ones blood-related was a grave crime, but the focus in this myth has been more of god’s deception. The gods were angry because they were misled with an ulterior motive of trying to prove that the gods were not all that intelligent as they seemed to be. Many have opined that the god’s reaction was less due to killing of the son by a father, but more due to sharing of the divine secrets with the mortals. This could have some bearing, as we have seen Zeus’s reaction to a similar incident that happens with Prometheus, a god, who stole fire from the gods and gave it to man (Read This is Utkarsh Speaking: The Gift of Fire ). Another way to look at it is that message was being given to people that gods did not like human sacrifice and the society at large should not resort to cannibalism. This theory has a significant bearing, especially since there have been records of human sacrifices to certain deities in the Greek pantheon. This myth could be seen as a case of changing perceptions towards the same, especially since some of the versions state that Tantalus offered Pelops as a sacrifice to the gods. The punishment of depriving Tantalus of all food and drink eternally brings out the severity of the punishment by the gods and that too to the favourite of the gods. According to the theory of functionalism of mythology, every myth serves a purpose. It has to have a cause or a reason for its existence. The above myth definitely sends a loud message, that no matter how close one is to the gods, there is no messing around with them. One cannot take them for granted and above all, they seek reverence and not ridicule. If one transgresses the lines drawn, one can face severe punishment and not just the concerned person, but his sons and other family members. The entire family and descendants have faced tragic deaths and this by itself is a very important lesson in this myth. Next we will read about Niobe, the daughter of Tantalus. If the heading of this article has surprised you a bit, then that sure was the objective! 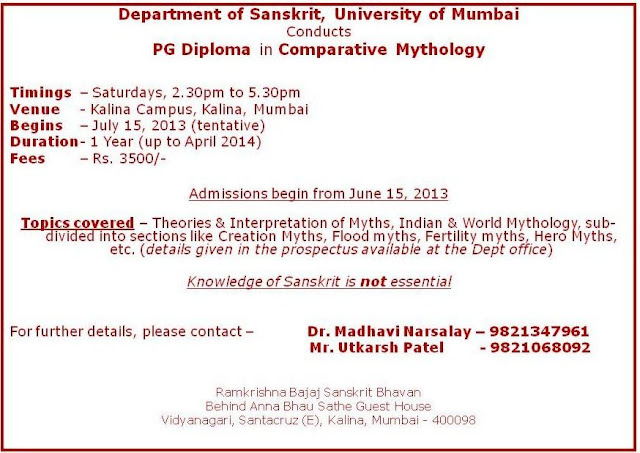 Yes, we do read about Hanuman in Mahabharata too. Hanuman was blessed by Ram to be cheeranjivi, i.e. immortal. We come across Hanuman twice in the epic of Mahabharata. The first and probably the well-known episode is when Bhim meets Hanuman. Bhim and Hanuman were brothers, as they were born of the same father, Vayu, the wind god. Once during the exile of the Pandavas, Draupadi asked for the Sughandika flower or the flower with the celestial fragrance. Bhim went into the jungle to get the flower. On the way, he found an old monkey lying with his tail blocking the way. Bhim haughtily asked the monkey to move its tail. Hanuman, asked him to do so himself, if it was bothering him. Bhim tried to move the tail, but couldn’t move it even an inch. Bhim knew that this was no ordinary monkey. He bent on his knees and asked him to introduce himself. Hanuman then showed him his usual form and Bhim sought pardon from him. This is considered a lesson in humility for an otherwise arrogant Bhim. The other episode is relatively lesser known. Once at Rameshwaram, while looking at the Ramsetu, the bridge built by Ram, Arjun commented as to what made Ram take the help of monkeys to build a bridge when he could have built a bridge of arrows all by himself. Hanuman appeared and challenged him to build a bridge of arrows, which could just about hold the weight of one monkey. Arjuna accepted the challenge, and started building a bridge of arrows, which he was good at. But Hanuman managed to destroy every bridge by just one step of his. Seeing this, Lord Vishnu appeared and chided both, Arjun for challenging the mighty Hanuman and Hanuman for making Arjun feel so small that he was contemplating taking his own life in shame. At this, Hanuman felt sorry and promised to help Arjun during the forthcoming war of Kurukshetra. Later during the war, he sat atop Arjun’s chariot, in the form of a flag, thus giving the chariot a sense of stability. 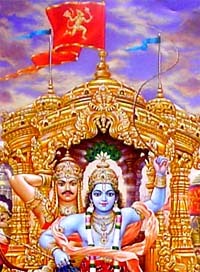 At the end of the war, Krishna asked Arjun, to get off the chariot first, which was against the war protocol. As soon as he did, Krishna followed and then came down Hanuman and after bowing to Lord Krishna, he vanished. No sooner had he vanished, the chariot was up in flames and reduced to ashes. A shocked Arjun was at a loss of words. Krishna explained that the chariot had withheld all the celestial weapons hurled at them, thanks only to Hanuman and him, the only two who could withstand the negative effects of such deadly weapons. If they had dismounted first, then he along with the chariot would have been reduced to ashes! The first one is a well known myth from Mahabharata, but the second one is a lesser known one, both giving lessons in humility to the Pandav brothers.